100 days. Heirloom released in 1894. Still popular because of its sweet potato-like flavor. 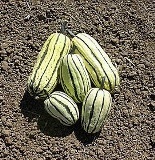 Cream colored with green striped fruits are 3" in diameter and 7" long.